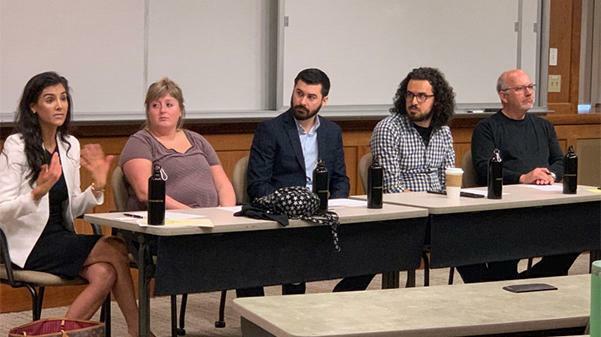 (From left) Ashleigh Anton, Melissa Spears, Alex Ferrario, Devin King, and Mike Rosenthal spoke with students about media careers in Harmon Hall Thursday afternoon. Five professionals talked to attendees in Harmon Hall Thursday afternoon about getting jobs in professional communication. The professionals were members of TEGNA, KMOX radio and 90 Degrees West. TEGNA is a media company that owns television stations, including KSDK in St. Louis. 90 Degrees West is a media creation studio in St. Louis that provides sound design, color grading, animation and more. Ashleigh Anton, human resource business partner with TEGNA, told students how to get the attention of media companies they are looking to work for. Alex Ferrario, host of the St. Louis Cardinals and St. Louis Blues pregame and postgame shows on KMOX, told students they should not expect to necessarily get paid when they are applying for internships in professional communication. Melissa Spears, senior producer for Show Me St. Louis, a morning TV show on KSDK, told students that being able to do multiple roles in media allows companies to value applicants’ skill more. “Putting in extra work at internships just because you may do something not your job title, that sticks out to employers. They want those people on their team,” she said. Other professionals who were a part of the panel were Mike Rosenthal, managing partner of 90 Degrees West, and Devin King, commercial producer for Show Me St. Louis.